Six and a half weeks ago, on September 29th, I started graduate school. Two days before that, I turned 18. Yes, you read that right. Yes, my life is weird. No, I’m not “a genius or something; yes, I’m smarter than average; no, I didn’t graduate high school super-young; and yes, I was homeschooled. Let me stop you there before you start making assumptions. I did learn to read at a young age, and my neurology (and immune system) have always been… let’s go with interesting. Yeah, that works. BUT. For the first four years of my life, I wasn’t that much of an outsider. Sure, I preferred reading, and small-group play, and I hated loud and/or high-pitched noises. I kept to myself a lot. I was “shy.” But I did preschool, and mommy-and-me classes, and the biggest issue was my food allergies, which we discovered the hard way when I was not quite two. Peanuts and tree nuts need to stay faaaaar away from me. When I was turning five, we looked for a school for me… but at the time, my food allergies were an issue. So I was homeschooled for that first year. One year turned into many, and my younger brother was homeschooled as well. We went on road trips, some of them weeks long, to national parks, historic sites, civil war monuments, all over the country. I was really into Laura Ingalls Wilder, so when I was seven I sewed myself a prairie dress and off we went to all the places she lived. There were really young barn kittens at De Smet, and I got to drive a little horse-drawn cart. When I was eight, my mom and a bunch of my friends’ moms founded Gifted Homeschoolers Forum. At first it was just a Yahoo! Group email list. Now, ten years later, it has members on every continent except Antarctica, reaching 300,000 people a week through Facebook, Twitter, other social media, their website, and their email list. Their publishing arm, GHF Press, has five books out with several more in the works, and they offer classes specifically for students who learn differently through GHF Online. Speaking of GHF Online, I’m teaching a class for them next semester – stay tuned for another blog post on that! When I told my then-best-friend in Southern Oregon, her immediate response was “Why don’t you stay at your own level?” I replied, “I am staying at my own level.” That is a good example of the attitude I was met with at every turn for eight years. So, September 28, 2009, the day after my 13th birthday, I sat down in History 111 at Southern Oregon University for my first school-style class, with grades and tests and everything. I failed the first midterm, and only passed the class with lots and lots of scaffolding from my mom. To be clear, she didn’t do the work for me. Instead, she taught me how to study, and how to take tests. I took the tests and I got exactly the grade I earned – not a plus or minus sign more or less. That was the start of a five-year career at SOU. My second year, as an early-entry student, I took Physical Environment I and II with Narcisa and Eric as the professors. Eric pushed me to get disability accommodations for testing, since I have documented learning disabilities. Although I came in thinking maybe I’d major in History or Writing, Narcisa got me hooked on Environmental Studies. She also became my advisor, mentor, and now one of my best friends. In that same class, I met Anastasia, who is also now a close friend. Those two were the first friends I made in college, and their acceptance of the 14-year-old sharing their classroom meant the world to me, then and now. When I was 15 I became a full-time student and started a Biology major as well. At 16, I met Shelby, and I decided I wanted to be friends when she made a joke about the vans on a class field trip being ba-ba sheep 1 and 2, with the sheepdog herding us along. We both have weird senses of humor. By age 17, I had decided that I had had enough of Southern Oregon, and I wanted to graduate. So… I took 54 credits in three quarters, did a capstone that my advisor called “better than most master’s theses I read,” and became the youngest-ever graduate of SOU. Made the newspaper and everything. 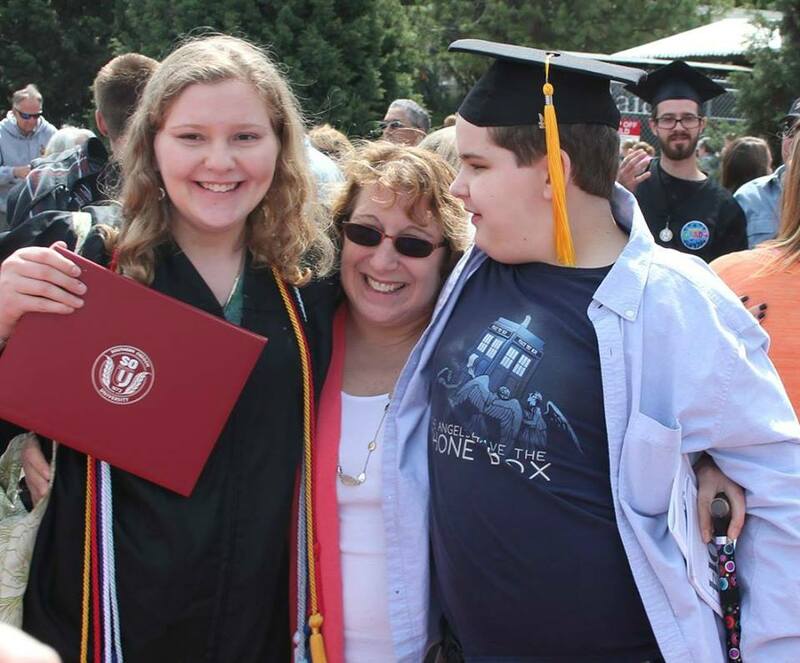 Me with my mom and brother after commencement. Here’s the thing, though. I didn’t do it alone. In some ways it felt like it – I had just a handful of friends at SOU, and more online that I saw a few times a year. However, I couldn’t have done it without all the support I received. My mom, who helped me homeschool college and particularly assisted with time management (and teenage growing pains of all kinds). My major advisor, Charles W., who provided me with the support and class substitutions so I could graduate when I decided I wanted to. Steve, the botany professor who made me decide I wanted to go to The Evergreen State College (where I am now a grad student), and who took the time to chat about his research and my interests. Both of the above helped me find my areas of interest in the field of environmental studies, and pursue them to the best of my abilities; those two were my favorite professors. Charles L. and Greg were the department chairs while I was there, and they too helped me succeed. Stewart guided me through my capstone experience, which was truly amazing. Despite the many, many times I cursed his name at obscene hours of the night, John gave me the academic challenge I didn’t realize I was missing, and provided the background information I need now to succeed in graduate school. My mom, step-dad, and brother all spent uncountable hours driving back and forth from Grants Pass to SOU in Ashland, an hour away. There’s so much more that all these people (and others) have done, but this is already a really long blog post. I spent five years at SOU, but never once did I truly feel that I was part of the community. I blended in; I stood out; I met people and worked with people and had fun with people. But I was never really one of them, at least in my own head. In August of this year, 2014, my family and I moved to Olympia, WA. In the four months we’ve been here, it has been good for us all. We all have more resources available to us. Most importantly for me, personally, I have graduate school. Grad school is amazing. My cohort is like one big family; my cohort is smart, and friendly, and a lot of them are a little quirky, too. My professors aren’t the only ones in the classroom that I enjoy talking to. I can have in-depth, intelligent discussions with my classmates. I’m not the odd one out; I’m not the weird kid among a sea of adults; except for being under 21, I’m just one of the crowd. They don’t care that I’m young. They like that I’m smart. I’m not shunned; I’m not excluded. I fit in. Assumptions are left behind. Judgments are withheld. Acceptance is the theme of the Master’s of Environmental Studies program at Evergreen, and it includes the students of the college. There are no words for the relief that thought brings me. I have plenty of other things going on – family life and personal stuff and two and a half internships and volunteering. I still fuss at myself because I’m socially awkward, but even when I say or do something weird/stupid, they don’t care. Because I’m part of the group. Because I fit in. And that is the best gift anyone could ever give me. This blog post is part of the Gifted Homeschoolers Forum “Finding Your Community” Blog Hop! This entry was posted in Gifted and tagged Education, Gifted, Homeschool. Bookmark the permalink. What a wonderful post! I would love for more gifted homeschoolers to start blogging 🙂 I’m so happy that you finally feel that you fit in (I loved grad school, too) and I am thankful that your mom started GHF. Madeline, you are completely inspiring. I am glad that you have found a place that feels “right” and you are a part of the community. I hope my girls can find that also some day! I am looking forward to hearing about where the future takes you. Thanks so much for your post. Today, of course, it’s hard to imagine a world without moocs and other online opportunities, but you were part of that initial change. You were also part of the initial change that your mother helped to usher in. In these ways and many others, I am so very grateful to you and your mother to have the chutzpah to do what you did. Mazel tov!!! Your mother is WONDER WOMAN! How she does it all. I’m very grateful to her for all she does for GHF! I’d feel lost without it. Your post is inspiring for the rest of us with younger homeschoolers. Brava! Such a great post! I admire you and your mom so much. Together you’re paving the way for other kids and parents. Thank you, Madeline! Thank you for a wonderful post Madeline! Excellent post, Madeline! So, so happy your graduate program is everything you want and deserve! I really enjoyed reading your post. You are such an inspiration!